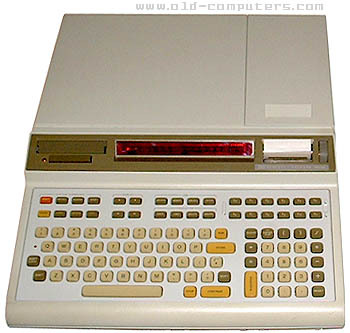 Although the HP-9825 was presented by HP as a desktop calculator with some computer features, it was really a desktop computer, in fact the first all-in-one computer everyone could use without being a computers guru. This system was lauched quite at the same time as the first personal systems (Altair 8800, Imsai 8080), however, its concepts and features were much more advanced but its price was about ten times the one of an Imsai, it thus wasn't intended to hobbyists market. � a magnetic DC-100 cartridge tape drive. Furthermore, four ROM-pack housings allowed to extand HPL capabilities or run specialized software, and three expansion slots provided communication capabilities with any type of peripherals: measuring instruments, printers, plotters, mass storage devices. The expansions operating system was developed by Joe Beyers who will become later Vice President of HP Computer Systems Business. Two additional versions of the 9825 were manufactured, the 9825S included a set of ROM packs and the 9825B featured a true typewriter keyboard instead of the low-profile version. In 1982, I worked with a model 9825B, connected to a flatbed plotter through the built-in HPIB interface. At the time, the 9825B had the only hidden-line plotting software available commercially (as opposed to military applications). In this case, the application was a graphical representation of optical diffraction patterns, which were later used in a college-level textbook on optics. A single plot could take several days to complete! The HPL language was indeed very close to BASIC, but with some interesting extensions, such as the ability to read and write data directly to/from HPIB ports. I used this ability to write several small programs that digitised points on completed plots (using the digitisation feature of the plotter; the pen could be replaced with a crosshair! ), and then drew 3-dimensional correct-perspective axes to label the plots, as the plotting software itself had no such function. We used the 9825B in our WC-130 aircraft to run our dropsonde weather data gathering equipment used in weather reconnaisance (Hurricane Hunters). The dropsonde (essentially a weather ballon-type radio device that decends via parachute rather than rising by ballon) would gather temperature/pressure/humidity data and transmit it via radio transmitter to a receiver and frequency counter, which in turn sent it to the 9825B for processing. Our computer program would number crunch for about 20 minutes and then spit out the weather code that we could plot and transmit back to surface stations for world-wide dissemination. It also served double duty playing crude games for us to pass the time during long transits to and from the storms. The last I used one was in 1987, and were pulled from service best to my recollection around 1988-89. A previous writer mentions that the language was very close to BASIC, which I also recall; most of the commands were the same as BASIC with the same line number/program flow. see more Hewlett Packard HP-9825 Ebay auctions !